Taking quality photographs while traveling on a family vacation can be challenging at times. Everyone has their own idea of what they want to see and do. Over the years, i have found that it is just best to go with the flow and the opportunities will present themselves. Now don’t get the wrong idea, you still have to put forth the time and effort. But if done properly you can enjoy a wonderful family vacation and return home with some fantastic memories, as well as a catalog of great images.This usually involves raising your tired, jet legged body from a dark and foreign room while everyone is fast asleep. You attempt to locate your gear without waking anyone or hurting yourself, you put your contact lenses into eyes that don’t want to even be open. Then comes the fun part, the process of exploring a location that you have never seen before……usually in the dark! You have done all of your research prior to your arrival, you know the approximate locations, you have seen some of the better images taken in the area, you know what time the sun comes up, etc. You are as prepared as you can possibly be, but you just never know what pitfalls you may encounter: from bad weather or misdirection, to that unsettling feeling you get when you hear the weird sounds that monkeys make in the trees at night, to drunk American tourists just coming home from the bars at 5am….i have seen my share!! Through the years I have developed somewhat of a superstition: no matter how tired you are on the first morning, you need to get up and get out and explore. This is your first impression of a new location, a blank canvas, and you have the pleasure of seeing it come to life as the sun rises. I never want to miss out on that amazing morning sky or the thick fog…..that only happened on the first morning, followed by a week of clouds and rain, etc. I love the nervous/ excited feeling i get when i am shooting a new location for the first time, it is similar to the one i used to get before playing sports. My mind is going a million miles an hour, i am running through scenarios, camera settings, compositions, filter choices, etc…..and i absolutely love it!! That being said, this post is not about one of those times. Sometimes you are just chillin’ soaking in a location, enjoying your family time, and the surroundings and the image comes to you! 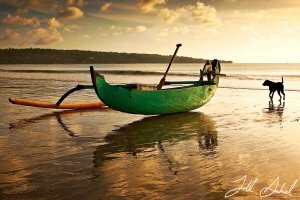 That was the the case with the image above of the Outrigger Canoe (click on it to view it large) taken on Jimbaran Beach in Bali, Indonesia. Interestingly enough this has become one of my most recognized images of all time. 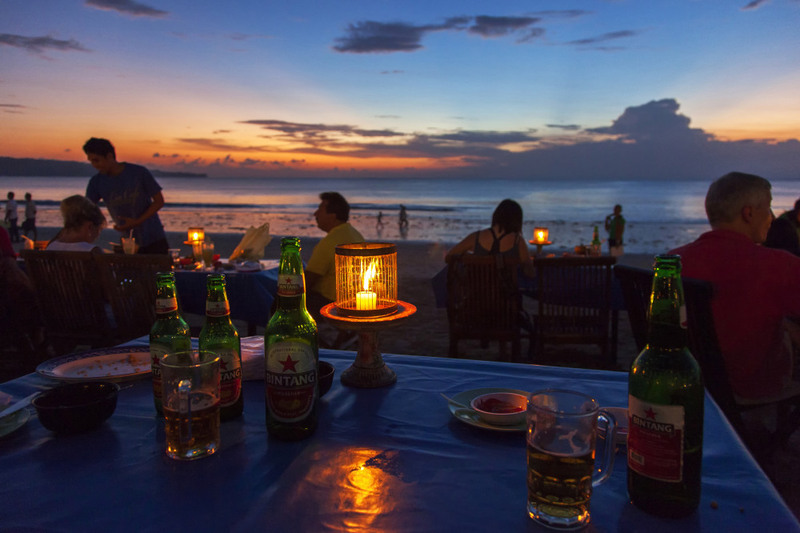 We were simply walking down the beach to grab a seat at one of the many beachfront restaurants to enjoy some simply prepared seafood, a glorious sunset, and few adult beverages all while sitting with our feet in the sand. As we walked down the beach, the local fisherman were preparing for a night of fishing. They were dragging their boats down to the waters edge, hand casting nets for bait fish, etc. all in preparation to go out and fish all night in these brightly colored outrigger canoes. The part that isn’t visible in this image is just how narrow these outrigger are……a foot wide at best!! It is amazing to think that these guys spend all night at sea in these boats usually alone, with nothing more than their gear and a lantern!! Thank goodness i took my camera with me that night. Just as an afterthought, i had grabbed my camera…..no tripod, extra lenses, filters, batteries, memory cards. I had to make due with what i had, which turned out to be an absolutely amazing photographic opportunity…..gorgeous location, great subject, bold light…..all followed by great food and drinks. How can you beat it? Sometimes all of the preparation you need is to relax, enjoy, and bring your camera! !